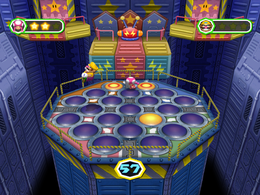 O-Zone is a Duel minigame in Mario Party 6. Its name is a pun on the Ozone Layer. On the game's website, the minigame is named "Tic Tac Whoa!" If the player wants to get O's quickly, then it is vital for them to watch the introduction. It shows all the spaces uncovered, then covers them and spins them around on the platform they're on. The player doesn't have to watch each one spin around because they go in a 360 degree turn. To win this minigame, the player must Ground Pound by pressing A twice on certain spaces that have O's under them. Once the player gets three of these out of five on the board, he or she wins. If the space the player Ground Pounds on is an X, lightning bolts come down on the player and they are stunned for a few seconds. Some spaces do not have a letter under it at all; nothing happens if these spaces are pounded. Rules – "Ground-pound the stage panels to find circles! Be the first to find three to claim victory!" Advice – "Before the game begins, carefully study the stage to figure out which panels are circles." This page was last edited on January 18, 2018, at 12:41.